Checked my user cp and I'm supposed to be getting instant notification on posts but they aren't coming. Also checked spam and it's not going there. Any other ideas I can try? Anyone else having this problem? Re: Not getting email notices. Make sure to click instant options in additional options when posting a new thread. Other than that I don't know. Its default is set to off. Everything I can see says I should be getting instant notice. Even checked and my email address is correct. I used to get email from this site. Maybe try to make sure your email is correct? Seems pretty straightforward but other than that I wouldn't know what else. Yep, I am officially stumped on this one. 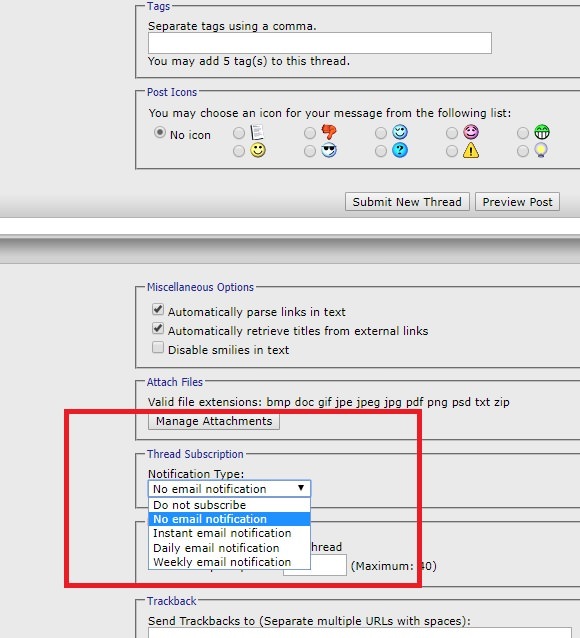 Every option on the forum is enabled to send email. Email address was right. I tried changing my email address to my second one and no notices are coming through there either. Checked spam folders at both addresses. Has to be some fault with this site, right? But no one else is having problems? Not sure who are/is the site admin, perhaps one of the moderators can handle this thing.. by all means it should work, though I never used the feature. I use the "Unread posts" feature to keep track of things, not the individual forums. Yeah, I've never used it myself, always used the unread posts tag as well. But no one else is having problems? I haven't received a single notification, even though my settings are all correct. I don't even have a user profile, it still says I haven't registered! I have to check the list of unread posts to find replies. I have noticed the same thing.... Email notifications seem to have stopped.